Major Tom Egan (Ethan Hawke) has a job where he’s able to kill half a dozen Pakistani terrorists in the morning then barbecue with his family in Las Vegas before nightfall. As a drone pilot, Egan can play 7,000 miles away from Nevada, yet even when he’s at home—as his wife Molly (January Jones) notes—he’s mentally still thousands of miles away. The six-tour veteran wants to be in a plane, but the Air Force is now leaning toward the type of war where we don’t actually have to be in the country with which we’re in conflict. For Egan in Good Kill, this new way of forging wars has launched him into a downward spiral. His family is secondary to protecting his country, and the constant trips to buy and drink full bottles of hard liquor make it clear that these new techniques weigh heavily on Egan’s mind. 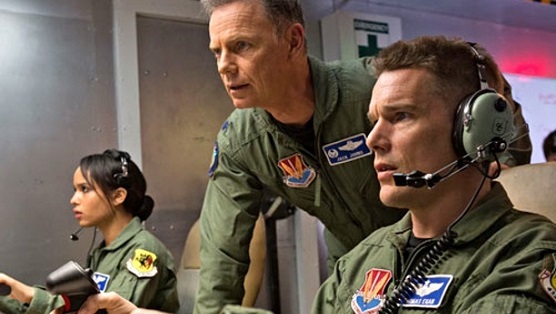 Andrew Niccol also seems to have a problem with this type of warfare, and Good Kill gives the writer-director a platform to hit his audience over the head nonstop with obvious diatribes. Occasionally Niccol (Gattaca) makes his grandiose views on big ideas work, as he did with The Truman Show and the oncoming reality TV boom, but more often with films like The Host, In Time and S1m0ne, he misses the mark completely. Instead of taking a nuanced approach to an important issue in our current military, Niccol fills Good Kill with characters who exist for the sole purpose of lecturing viewers on the pros and cons of drone warfare. When the CIA takes over the drone program, and seemingly innocent bystanders are blown to bits, their orders become more questionable. New recruit Vera Suarez (Zoë Kravitz) observes that they’re basically just creating new terrorists, and that they may not be any better than the people they’re killing across the globe. Meanwhile, Zimmer (Jake Abel) believes that everyone in the countries they attack are guilty by association. At the very least, Good Kill puts us in the curious position of witnessing a soldier in war and at home at the same time. We see attempts to balance his family, while also suffering signs of PTSD and hiding the details of his horrific wartime actions that have occurred only hours prior. However, Hawke’s character is mostly quiet, and when he gets angry he’s even quieter—and Hawke doesn’t exactly pull this off. There might be plenty going on under the surface, but not much that the audience sees. Egan is the one character with the potential to show rather than tell, but he fumbles the opportunity. Counterbalancing this is Jones, who falls closer into the unfortunate trope of nagging military wife. Niccol’s script and direction are frustratingly heavy-handed. He depicts Egan’s home overhead much in the same way Egan looks over the areas he’s tasked to bomb, and simply has his characters recite the bullet-point facts of the film’s message. Even the usually fantastic Bruce Greenwood, as Egan’s boss, is little more than a means of highlighting flaws in the program, observations that any idiot could conclude. If anything, Greenwood becomes emblematic of Good Kill’s biggest problem: its inability to trust the audience’s intelligence.